Tumor – The Comic – Behind the Scenes » Aint It Cool News on Tumor! Home > Promotion	> Aint It Cool News on Tumor! Aint It Cool News on Tumor! Thank you to Ambush Bug and the fine fellows over at AICN for the great review of the forthcoming Chapter 4! This hard edged detective story reminiscent of D.O.A. and MEMENTO is getting better from one chapter to the next. Joshua Hale Fialkov writes a tragic tale of a man who is slowly losing his mind. Diagnosed with an inoperable tumor pressing against his brain, Frank Armstrong’s mind is fragmenting. One second he’s in the present working on a case and the next he’s in the past holding a woman he knows he lost long ago. To make matters worse, there’s a dame (of course there’s a dame) that looks a lot like Frank’s old flame in the middle of this case. Frank is completely confused and losing control of his mind and body, but determined to solve this last case before the tumor in his head overcomes him. In this fourth chapter, we find out that Frank also feels no pain. When he realizes he’s broken his leg (he did so in the last chapter in a daring escape from his hospital room), he looks at it with sort of a fascination, in an “oh what’s this” sort of way rather than shock. 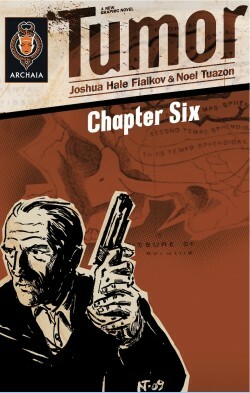 Fialkov is churning out one great mystery yarn, but also an amazing character study. You really feel sympathetic to Frank as he is stumbling along trying to keep things together in his head. Fialkov paces this story perfectly, flipping reality on its ear just when you’re getting invested in the story at play and the scratchy images by Noel Tuazon become more engaging as the chapters whiz by. His depictions of Frank’s worried brow speak volumes. This is a heartbreaking tale that can’t end well, but I’m still rootin’ for Frank to solve the case. TUMOR is available on Amazon Kindle for download.